How to Choose A Good Melon…. 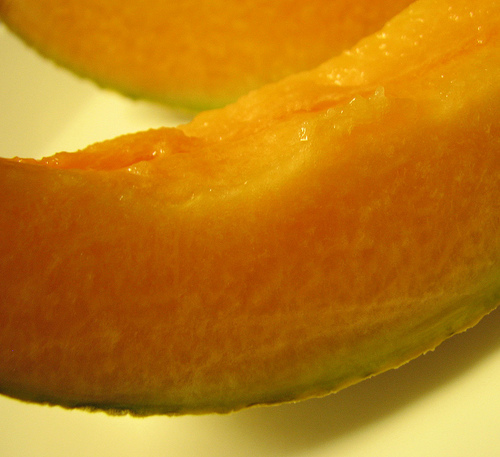 It isn't difficult to purchase a ripe melon when you know what to look for. I've included photos below to help you make a knowlegable choice. Hope you'll give it a try for melon season is upon us. Okay, this sort of thing happens to me in the produce section frequently. I must look relaxed and as if I know what I'm doing or perhaps I'm just a little OCD when selecting my fruits and veggies. I'll admit though, this encounter was more fun than most of my shopping experiences. I stood in the store, intently perusing the melons. I heard a male voice say, "How do you know when a melon is ripe?" I tried not to smirk, knowing that if I did I was going to LOL. I looked up, surprised to see a fireman standing before me in his blue and yellow S.F. Fire Department t-shirt. "Well… I take a few things into consideration when making my choice" I say casually. "I usually choose the medium sized ones and look at the stem end to determine when it was harvested. If it was cut from the vine and has a long green stem, that means it was harvested early, so it is not vine ripened. 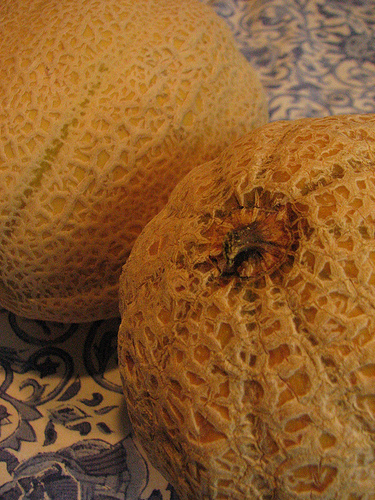 If the stem has dried up and fallen off or is loose enough to gently pull away from the melon, than it's probably ripe. I look for the ones that have a clean divot, like that one, see where the stem used to be. Then I press on the divot to see if it yields a bit to the pressure, which is a good sign. Oh! And when most melons are fragrant, they’re ripe." I handed him one of the three I'd been comparing and said, "Does that help?" He grined and said "Yeah thanks! Wow! You really know your stuff". I shruged as I turned to walk away, then glanced back at Mr. SFFD and replied "I'm a chef, it's what I do." 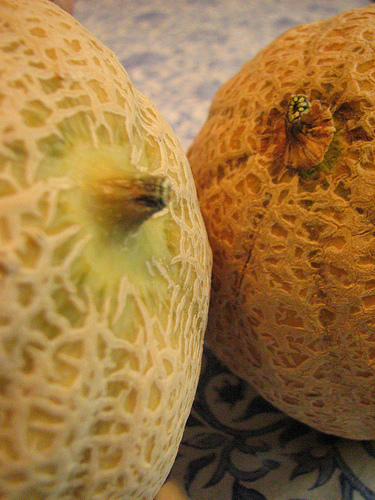 If you can only buy a melon with a stem on it, let it ripen on your counter until you can tug the stem from the fruit. This will happen when the stem starts to dry. 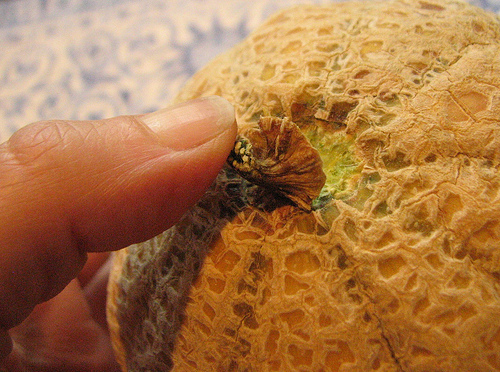 When melons mold at the stem end and get soft patches, you may find they taste winey and are past their prime. If a bit too soft but really sweet, you can make a quick soup with the following recipe. I like to cut a melon up when it's at room temperature, but then chill it until ready to serve. Peel and seed melon, cut into wedges. Place sugar and ginger in blender and puree. Add lime juice and cinnamon and blend until smooth. Add a slice of melon to the ginger mixture and puree. Pour into a large bowl. Blend the remaining melon with yogurt and ice until smooth. Whisk all the ingredients together in a bowl. Chill soup and serving bowels in the freezer for 1/2 hour. Garnish each serving with fresh berries or a berry puree sweetened with a touch of sugar. This entry was posted in Uncategorized and tagged "choosing a melon in the produce section", "summer noshing", buy fresh, buy local, cantaloupe, chef@isimmer, chef@isimmer.com, cooking tips, dessert for two, food, fruit, healthy, healthy dessert, melons, picking fruit, quick summer dessert, seasonal cooking, summer, tuscan melon. Bookmark the permalink. 10 Responses to How to Choose A Good Melon…. 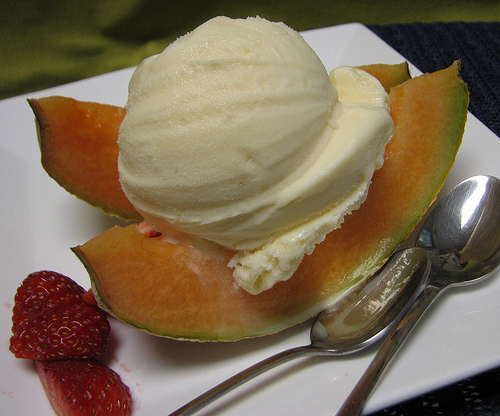 Thanks for sharing this delightful recipe and your tips for melon selection. thanks. And for pineapples, you go to the small, innermost leaves on top and try to pull 'em out. They should come out easily, but without jumping into your hand. Bet you knew that already. Thanks Mark, yes, you are absolutely correct about the pineapple. Great input!! I may as well check things out. I like what I seee so i am just following you.